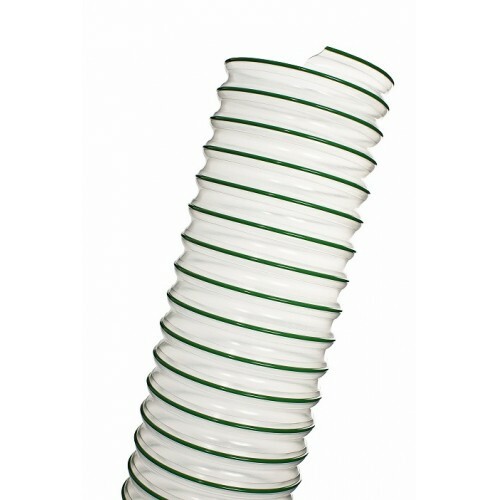 Colour: Translucent with green PU coated steel spiral. Technical Features: Special eco-friendly Polyurethane duct produced with renewable natural sources and biological components according to the ASTM D 6866 regulation. The revolutionary compound allows to reduce considerably CO2 emissions during its production and waste disposal process. Wall thickness from 0.4mm to 0.75mm. Slightly corrugated inside and outside. Properties: high mechanical properties, extremely light, flexible and very good in bending. Very good resistance to abrasion, it comes in compressible lengths (4:1) to save space and delivery costs. Halogens free conform to RoHS and completely free from phthalates. Standards: RoHS 2011/65/EU Directive, REACH Regulation (1907/2006), TRB S 2153, ASTM D 6866. Suction of pellets, granulates, abrasive powders, also suitable in wood working industries, dust extraction.